Castilleja linariifolia, in the Grand Teton National Park, Wyoming. An illustration from National Geographic in 1917. ^ a b c "Wyoming State Flower Indian Paintbrush Castilleja linariaefolia". Netstate. Retrieved 2008-04-08. ^ a b c "UC/JEPS: Jepson Manual treatment for Castilleja linariifolia". The University and Jepson Herbaria, University of California, Berkeley. Retrieved 2008-04-08. 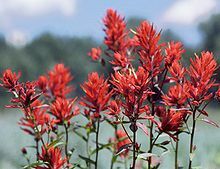 ^ "PLANTS Profile for Castilleja linariifolia (Wyoming Indian paintbrush)". USDA. Retrieved 2008-04-08. ^ "Wyoming Statute 8-3-104". Wyoming Statutes. Archived from the original on 2008-05-11. Retrieved 2008-04-08. Wikimedia Commons has media related to Castilleja linariifolia.